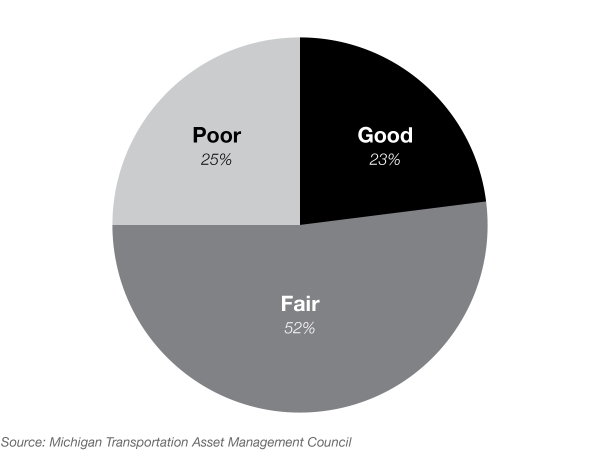 The Michigan Transportation Asset Management Council, a legislatively created group comprised of state and local government representatives, advises and assists Michigan’s road agencies. It surveys and collects data on the conditions of Michigan roads. TAMC condenses some of the PASER ratings into three categories to rate road conditions. It groups ratings 1-4 into one category called “poor,” ratings 5-7 are grouped together as “fair” and ratings 8-10 are grouped and called “good.” These categories help government agencies identify what type of work needs to be done on a road. Generally speaking, good roads need little or no maintenance, roads in fair condition need routine and preventative maintenance and roads in poor condition require structural improvements. Bridges in Michigan are rated using the National Bridge Inventory Rating Scale, which rates bridges on a 0-9 scale. It was established by the Federal Highway Administration, and rates three elements of a bridge: the deck, superstructure and substructure. The entire bridge is rated based on the lowest score of these three elements. In other words, if any one of these components of a bridge is rated “poor,” the entire bridge is given a “poor” rating. Graphic 2 summarizes this rubric. 9 Excellent No problems noted. 6 Satisfactory Structural elements show minor deterioration. 5 Fair All primary structural elements are sound but may have minor corrosion, cracking or chipping. May include minor erosion on bridge piers. 4 Poor Advanced corrosion, deterioration, cracking and chipping. Also significant erosion of concrete bridge piers. 3 Serious Corrosion, deterioration, cracking and chipping, or erosion of concrete bridge piers have seriously affected deck, superstructure, or substructure. Local failures are possible. 2 Critical Advanced deterioration of deck, superstructure, or substructure. May have cracks in steel or concrete, or erosion may have removed substructure support. It may be necessary to close the bridge until corrective action is taken. 1 Imminent Failure Major deterioration or corrosion in deck, superstructure, or substructure, or obvious vertical or horizontal movement affecting structure stability. Bridge is closed to traffic but corrective action may put back in light service. Roads in Michigan are grouped into two general categories: trunkline and nontrunkline roads. Trunkline roads are state roads that carry an “I,” “US” or “M” designation. 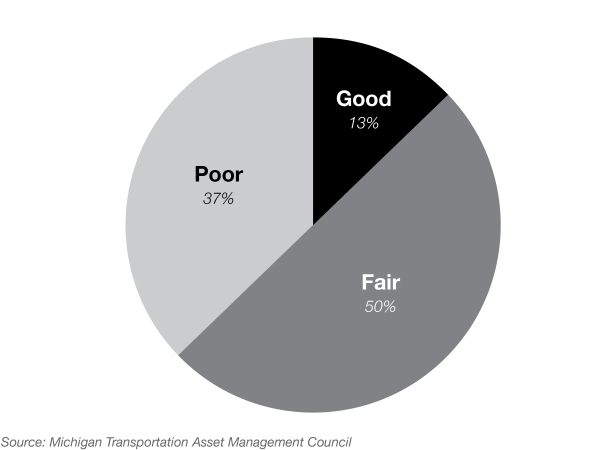 State trunkline roads comprise 8 percent of Michigan road miles yet carry 53 percent of all passenger traffic and about 70 percent of all truck traffic. A centerline mile is the total length of the road measured along its centerline. The 9,668 centerline miles of trunkline roads correspond to approximately 30,000 lane-miles, or the number of centerline miles of road multiplied by the number of lanes. Building and maintaining trunkline roads is the responsibility of the Michigan Department of Transportation. 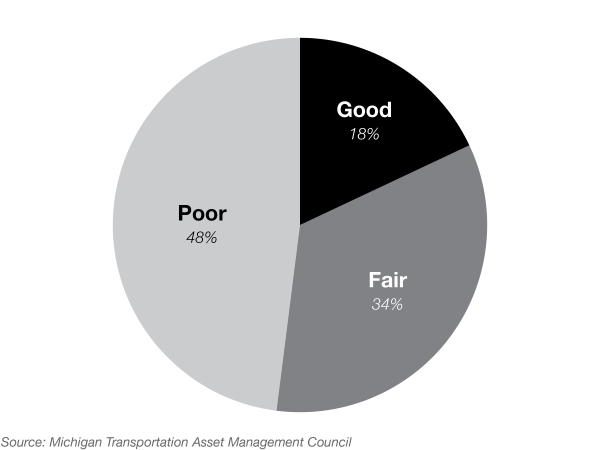 Graphic 3 summarizes the condition of Michigan’s trunkline roads in 2017. Twenty-three percent of the lane-miles of trunkline roads are in good condition, 52 percent are in fair condition, and 25 percent are in poor condition. Overall, for state trunkline roads, the glass could be reasoned to be half full. 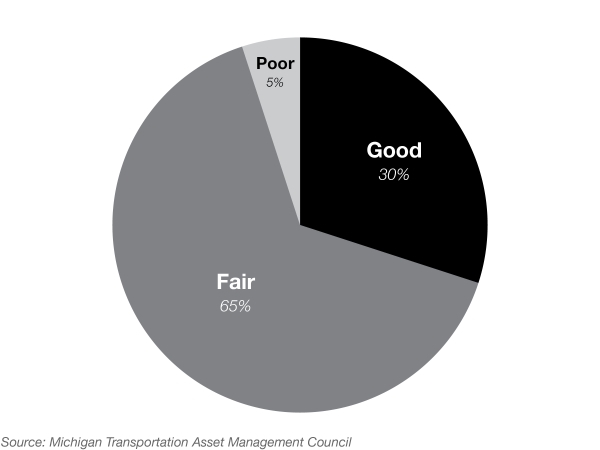 On one hand, 75 percent of the lane miles carrying over half of Michigan’s passenger traffic and nearly three-quarters of its truck and commercial traffic are in fair or good condition. Most of these important roads, then, need only routine and preventative maintenance to maintain or improve their quality. On the other hand, MDOT forecasts that the condition of these roads will worsen substantially over the next several years. MDOT projects the “remaining service life” of a lane mile: how long a road has before it needs to be rehabilitated or reconstructed. The good news is that about 85 percent of the lane miles on trunkline roads are projected to have a remaining service life of three years or more in 2018. But MDOT projects that by 2024, only about one-third of trunkline roads will have a three-year or longer RSL. 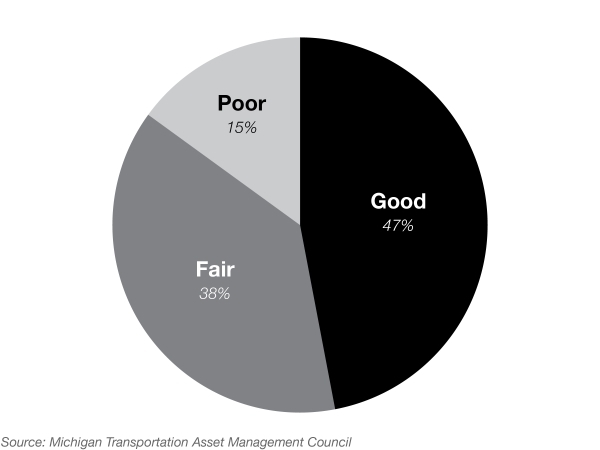 This means that two-thirds of Michigan’s trunkline roads will fall into the poor rating category and need to be reconstructed by 2024. Further, MDOT estimates that trunkline pavement condition peaked in 2008 and that in each year between 2018 and 2024, 7 percent of trunkline miles, or 2,000 lane-miles, will deteriorate into poor condition until only one-third of trunkline miles are in fair or good condition. Michigan has approximately 4,500 state trunkline bridges. As Graphic 4 shows, 30 percent were in good condition, 65 percent in fair condition and only 5 percent were in poor condition in 2017. According to MDOT forecasts, trunkline bridges, like trunkline roads, will deteriorate over the next several years. But their deterioration will be more gradual, with nearly 93 percent still being in fair or good condition by 2024. County roads and bridges are considered nontrunkline, and are the responsibility of county road commissions. A county road is categorized as either a primary or a local road, based on its importance as assigned by the board of directors of the county road commission and subject to the approval of the State Transportation Commission. Primary county roads may be located within city and village limits. Roads within townships are also under the jurisdiction of the county road commission. Primary county roads are “federal-aid roads,” meaning that federal funding can be used to repair and reconstruct them. According to the Michigan Department of Transportation, about one-third of Michigan’s roads are eligible for federal aid. Local county roads, alternatively, are “non-federal-aid roads.” Local road agencies collect data on the pavement condition of all federal-aid roads, but on only some non-federal-aid roads. There are approximately 90,000 centerline miles of county roads in Michigan and 5,800 country bridges. The condition of county roads is substantially worse than that of state trunklines. Graphic 5 shows that nearly half the federal-aid lane miles of county roads — about 48,000 lane miles — were in poor condition, 34 percent were in fair condition and only 18 percent were in good condition in 2017. The condition of county bridges is better. Nearly half of federal-aid county bridges were rated in good condition and only 15 percent in poor condition in 2017, as Graphic 6 illustrates. Roads in cities and villages that are not under the jurisdiction of the county road commission are maintained by their respective municipality. The city or village council designates important streets as “major streets,” with the designation subject to the approval of the State Transportation Commission. There are approximately 21,400 centerline miles of city and village roads in Michigan. Major streets are federal-aid eligible while other local city and village streets are not. There are almost 4,400 centerline miles of federal-aid city and village roads, corresponding to approximately 11,000 lane miles. The condition of federal-aid city and village roads is similar to that of county roads. As Graphic 7 illustrates, 46 percent were in poor condition and only 17 percent were in good condition in 2017. The condition of city and village bridges is also similar to those in the counties: 46 percent were in good condition in 2017 and only 10 percent were in poor condition, as Graphic 8 shows. Roads considered “local” and maintained by counties, cities and villages are not eligible for federal aid. There are approximately 165,000 lane miles of these roads. These roads include subdivision streets in townships that are under the jurisdiction of the county road commission and neighborhood streets in cities and villages under the jurisdiction of their municipality. These road agencies are not required to collect PASER data on these types of roads, although some do. Consequently, TAMC only had data from 125 different local government agencies for 9,239 lane miles of these roads in 2017, which is only about 6 percent of the total. [*] As seen in Graphic 10, more than a third of these roads are in poor condition. Despite the small sample size, TAMC believes that it is safe to assume that the pavement conditions of non-federal aid roads is worse than that of federal-aid roads. 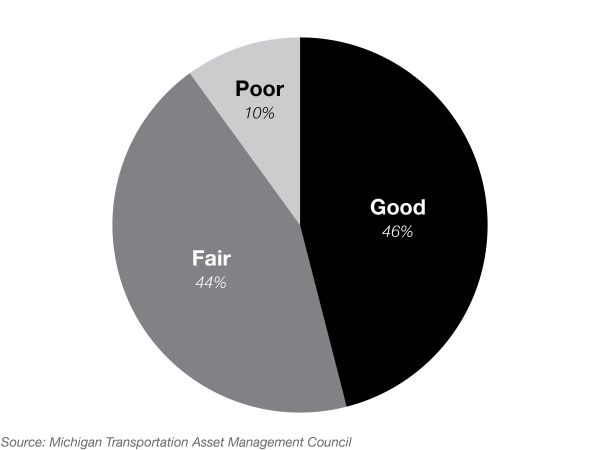 [*] There appears to be some discrepancy in these figures as reported by the Michigan Transportation Asset Management Council. The online dashboard displays the numbers provided here, but its 2017 annual report includes different figures. That report states that 71 agencies submitted ratings for 17,092 lane miles in 2017. Based on that data, 49 percent were rated poor, 38 percent fair and 19 percent good in 2017. 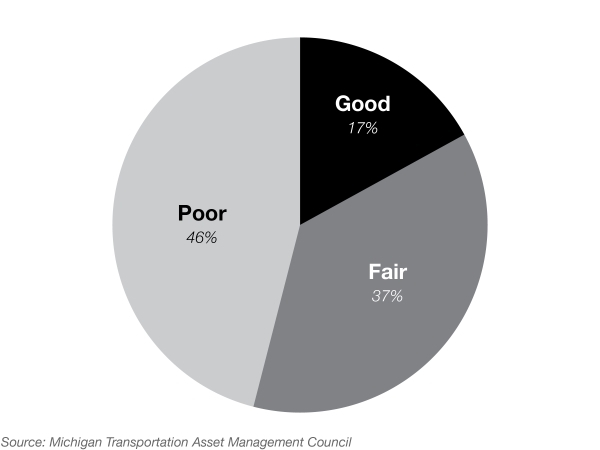 “Michigan’s 2017 Roads & Bridges Annual Report” (Michigan Transportation Asset Management Council), 9, https://perma.cc/T385-BV9L.